Japanese Prime Minister Shinzo Abe will arrive here on Wednesday on a two-day India visit during which he and PM Modi will hold the 12th India-Japan annual summit here. Gandhinagar: In a first, Prime Minister Narendra Modi and his Japanese counterpart Shinzo Abe would take part in a road show in Ahmedabad in Gujarat on September 13 when the latter begins his visit. The eight-km-long road show would start from the Ahmedabad airport and culminate at the Sabarmati Ashram, according to the BJP. "This is for the first time in the country when our prime minister along with the prime minister of another country is doing a joint road show. The Japanese PM is landing here directly on September 13. This makes the occasion more important, as he is visiting a state on the very first day of his India visit," Gujarat BJP unit president Jitubhai Vaghani told reporters today. He said both the leaders will be accorded a "grand welcome" along the route of the road show. Ahmedabad Municipal Corporation's standing committee chairman Pravin Patel said a large number of people, including singing troupes who will be performing at 28 different locations along the route, will greet PM Modi and PM Abe. "On the entire route of the the road show, which will also pass from Sabarmati Riverfront, we have erected 28 small stages where dancers from 28 different states, all dressed in their traditional attire, would showcase their performance when these leaders pass," said Mr Patel. After visiting the Sabarmati Ashram, where Mahatma Gandhi lived between 1917 and 1930, both the leaders would take a break till evening, said Patel. "In the evening, both the PMs would visit the iconic Sidi Saiyyed Mosque in the eastern part of the city. The mosque is known across the world for the stone lattice work," he said, adding that both the leaders would be shown a presentation about the city's heritage on the occasion. PM Modi and PM Abe would then have dinner at 'Agashiye' restaurant located near the mosque, Mr Patel added. On September 14, PM Abe and PM Modi will attend the ground breaking ceremony for the ambitious Mumbai-Ahmedabad High Speed Rail Project, commonly referred to as the Bullet Train project. 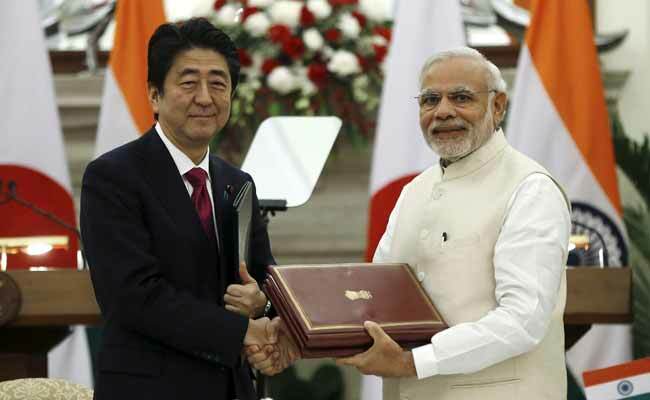 Later that day, both the premiers will hold the 12th India-Japan annual summit at Mahatma Mandir in Gandhinagar.